Clean and comfort apartments. Big and interesting territory. 2 swimming pool was working in the winter. The staff and supervisor were absolutely wonderful. We arrived at 10;30PM needed a last minute upgrade to a two bedroom suite, and they spent close to an hour searching, calling, and changing our original reservation to make it work for us. Then they made a pizza delivery order for us (we don't speak Portuguese) and helped us find a BOGO deal! They were patient and kind and fun to talk to. The view of the beach was gorgeous from our balcony, and everything was spotless. I would never consider a different place if I were to ever come back to the region. 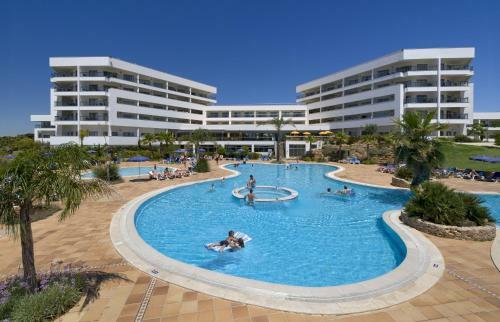 Great pools, spacious apartment & balcony, perfect for children, all of the staff were very helpful. Great facilities! Excellent location! The best you can get when travelling with kids. Amazing pools for children and brilliant view of the ocean from the Prestige building. It felt unspoiled and quiet at the beach too. We will definitely be returning soon. we didnt need to leave the property. so many pools to choose from. Very family friendly and set up for children is fab! Apartment spacious and confortable, amazing patio. Covered swimming pool was great on less sunny days. The extra large balcony was very useful. 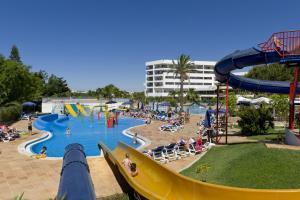 The indoor pool for the morning swim and then the large amount of outdoor pools to suit all age groups with slides etc. for when it warmed up a bit was great. Everything we needed was in the apartment and very clean. Not much entertainment at this time of year but it was very good. Our apartment was on the top floor of the brand new Prestige Building. The views of the Atlantic Ocean and manicured grounds were amazing. We were one of the first occupants of this apartment, so everything was clean, comfortable and airy. There are many facilities nearby for drinks , food and entertainment. Lock in a great price for Alfagar Aparthotel – rated 9 by recent guests! Alfagar Aparthotel This rating is a reflection of how the property compares to the industry standard when it comes to price, facilities and services available. It's based on a self-evaluation by the property. Use this rating to help choose your stay! One of our top picks in Albufeira.The Alfagar Aparthotel has an enviable location overlooking the ocean, offering a memorable panoramic view of the coastline. 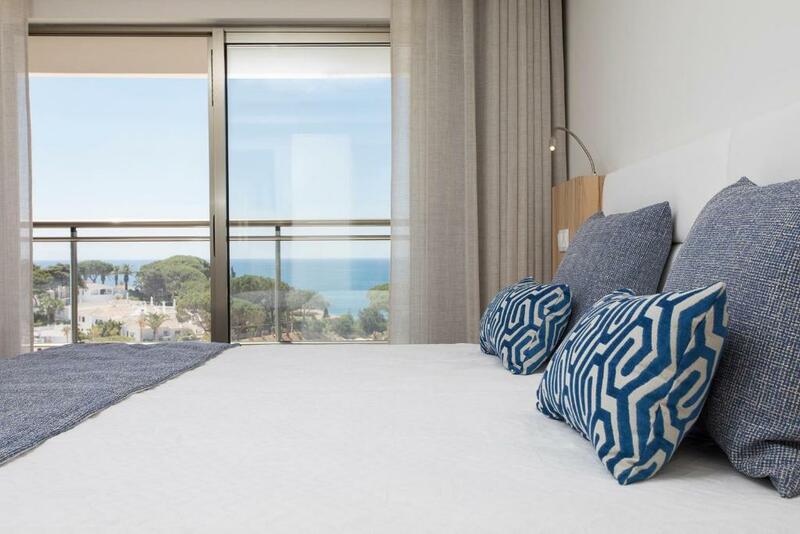 Apartments with one or two bedrooms are available and may offer sea or garden views. The new "Prestige" units offers a renewed and modern décor. The Oliveira Restaurant offers a buffet and features a terrace with pool views. At the on-site bar guests may taste a vast selection of drinks and watch the main sports events. In addition, guests may enjoy the 3 other restaurants and bars of the other Alfagar properties nearby. The access to Santa Eulália Beach is private and made of steps. Within a few miles you may find other beautiful sandy beaches. Alfagar Aparthotel is surrounded by beautiful gardens that extend to Alfagar Village, with a total area of 11 hectares. Balaia Golf Course is 0.6 mi away. 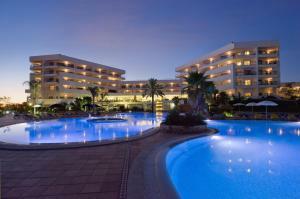 When would you like to stay at Alfagar Aparthotel? The apartments have living rooms furnished with convertible double sofa-beds, dining areas an kitchenettes. The bedrooms include twin beds, wardrobes and safes. The spacious and furnished balconies overlook the garden. The apartments have living rooms furnished with convertible double sofa-beds, dining areas and kitchenettes. The bedrooms include twin beds, wardrobes and safes. The spacious and furnished balconies overlook the ocean. This spacious 2-bedroom unit is air-conditioned and features a living area with sofas and a satellite TV. The unit includes an equipped kitchenette and a balcony with garden views. This 2-bedroom unit is air conditioned and features a living area with sofas and a satellite TV. The unit comes with an equipped kitchenette and a balcony with sea view. This unit is air-conditioned and features a living area with sofas and a satellite TV. 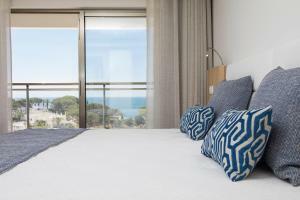 The apartment includes an equipped kitchenette and a balcony with ocean views. This spacious 2-bedroom unit is air-conditioned and features a living area with sofas and satellite TV. The apartment has a kitchenette and a balcony with ocean views. Located in lower floors, it has a spacious glass balcony with views of our gardens and/or swimming pools. The living room is fitted with a sofa bed for 2 people and a dining area. The bedroom features twin beds. Located in higher floors, it has a spacious glass balcony with magnificent views of the ocean. The living room is fitted with a sofa bed for 2 people and a dining area. The bedroom features twin beds. Located in middle floors, it has a spacious glass balcony with views of the ocean. The living room is fitted with a sofa bed for 2 people and a dining area. The bedroom features twin beds. Located in lower floors, it has a spacious glass balcony with views of our gardens and/or swimming pools. The living room is fitted with a sofa bed for 2 people and a dining area. The two bedrooms feature twin beds. Located in higher floors, it has a spacious glass balcony with views of the ocean. The living room is fitted with a sofa bed for 2 people and a dining area. The two bedrooms feature twin beds. House Rules Alfagar Aparthotel takes special requests – add in the next step! Alfagar Aparthotel accepts these cards and reserves the right to temporarily hold an amount prior to arrival. Upon arrival, a refundable damage deposit will be charged. 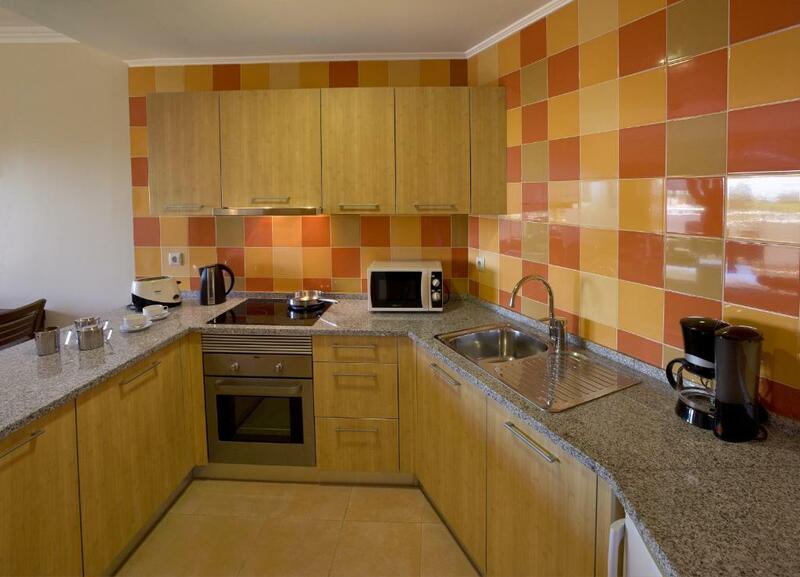 The deposit is EUR 150 for the 1-bedroom unit and EUR 200 for the 2-bedroom unit. This deposit will be refunded after the apartment has been checked at check-out. New Year's parties are not allowed in the apartments or any area of the complex. Please note that guests must specify in the Special Requests box at the time of the reservation in which days they wish meal supplements. All apartments are cleaned 5 times per week. Towels are changed 3 times per week and linen once per week. Please note that the water slides for children have a seasonal operation and are closed between 1st November and 31st March. 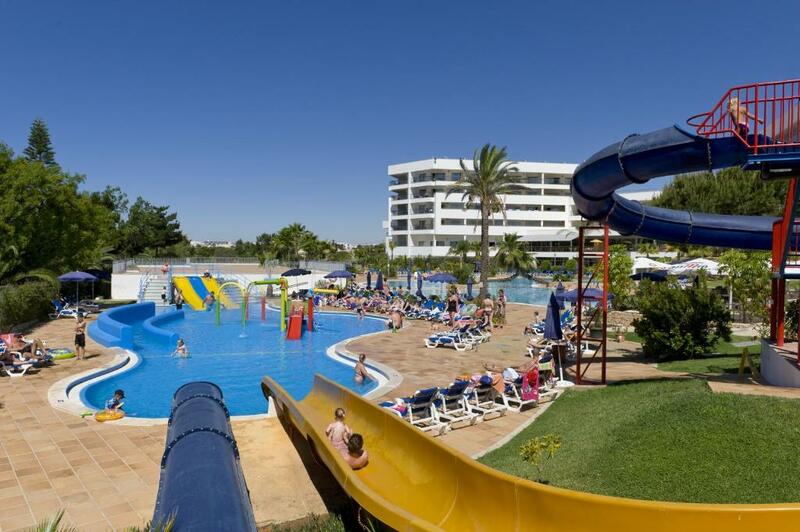 The opening of the water slides takes place during the month of April, with no exact date specified. The availability of this facility is also subject to weather conditions. A damage deposit of EUR 150 is required on arrival. That's about 168.65USD. You should be reimbursed on check-out. So much single use plastic: cups, straws, crappy gimic toys... Lack of vegan or vegetarian options for kids. Indoor pools are cold. Everything else! The staff are amazing - Riu and Daniel - they sorted out taxis and trips for us. The massages are heavenly! The pools, the breakfast, the rooms, 2 amazing female singers. Our second time this year - it's lush! The beach is really beautiful! There was a little spider in the room, not a big problem! The room was spacious and clean and staff were very nice to us. The facilities are super, there is a private beach, a bar with live music, pool (more than one), parking, mini market, late check-in, everything that you need. Had to get taxis everywhere as its out from main albuferia.it says private walkway to beach .it was 112 steps my mother couldnt do steps so we had to get taxi to beach .reason i booked here was it stated easy access to beavh . Everything was perfect & exceeded our expectations. What a find. Would recommend 100% Fantastic Apartment/Hotel in New block. There should be a restaurant in alfagar aparthotel. The dining in the main hotel was not great. The balcony view great. The facilities in room were good. Two tv's were great.. plenty of space. Nice bathroom with all amenities.. There wasn't really anything to dislike, it was super clean and just a nice quiet place to stay. Everything staff were lovely, facilities were brilliant. We were unlucky with the weather for the first few days of our stay, but it didn't matter because the hotel has two indoor pools so our little girl was very happy. Also there was a new tapas bar that had just opened, it was a lovely space to just relax and have a glass of wine, or some lovely cocktails. I'd recommend the caiprihna 😍. We also had dinner here and it was just beautiful and the staff there are brilliant. Friendly staff, amazing apartments. Kids would like indoor and outdoor pools. Really worth. Indoor pool need refurbishment, breakfast cold , every day the same breakfast! The outdoor pools are great especially for the kids , indoor pool need refurbishment, only allowed with swimming hats on ! Cafeteria staff bit rude , waiting for coffee 10mins + even when is empty, I’m wondering what will happen during the summer holidays when the hotel going to be much busier and packed ! Breakfast every day the same , scrambled eggs ,baked beans not very warm ! We didn’t go for buffet dinner at the hotel as we read not great experiences from previous guests! We ate out every night , we can highly recommend Portobello pizza place at Santa Eulália, 4mins walk from our hotel , great pizza &pasta and amazing desserts -all homemade! The beds were so comfortable. The apartment was so well stocked. Room was spotless. Lovely new Prestige apartment, excellent half board meals, plus exciting playgrounds and really big, warm indoor pool for the children. End of March so really quiet. All the staff were excellent. Lovely beach. Came back from a 7 days break at Alfagar this morning . What a lovely place and so much to do . Will defiantly recommend and we will be back .